At just over 80 pages for almost £9 it seemed overpriced but I liked this book for its lean condensed style. As an autobiography it is not necessarily a recipe for how to make a business rather a retrospective review of what worked for one person, with a few thoughts and insights to invite reflection and stimulate discussion. Find and train your replacement when quitting a job! Why bother interviewing new employees? Don’t bother with T&C and other legal stuff. Don’t outsource skills if you can learn how to do it yourself. Business is why we are here this morning. 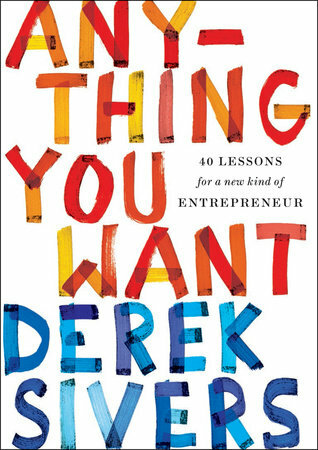 What does Derek say about business? When you make a business it’s a little universe where you control the laws. Make your own rules about what you want your business to be. Business is about making dreams come true, money is secondary. Doing what makes you happy is more important than quick profit or expansion. A business plan should be simple, hopefully no more than a few minutes to prepare. Be flexible; no business plan survives first contact with customers. Improve or invent until you get a huge response. (don’t flog a dead horse). don’t pursue business only answer calls for help. Filter new projects. Use ‘Hell Yeah, or No’ to decide whether to proceed with an idea. Ideas are worthless without execution. Over-deliver at times, be generous, do the right thing. The best way to grow your business is to focus entirely on existing customers. Many little customers better than one big one. Stop worrying about what other people say you should be doing. A combination of not reading a contract with his father and some bad advice from a staff member at a bank led to him having to buy 90% of the company back from his father for $3.3 million. Having to fire an employee who ignored the prime directive. Trust but verify. His employees set up a profit sharing scheme. Delegate but don’t abdicate. Reality check: are you happy, are you helping people, are you profitable? Get out before everything gets too stressful.